Not that the others aren’t talented (just like producers and writers are talented), but this is the dude with the specialized skills and the outsized ego. He knows how to maneuver past those critical points in your brain, getting to wherever the problem is. She’s got the nerves of steel and the rock-steady hands. He knows the ins and outs of the internal wiring, and only he can defuse the neural bomb without it exploding. And she is treated –and paid – like a rock star. If anyone deserves the god complex, it’s the brain surgeon. Now… you could pay a brain surgeon to come in and do the whole shebang: shaving, anesthetizing, brow-mopping – OK, maybe not mopping his/her own brow – but you get the idea. But it would be enormously expensive and wasteful to do so. There are only so many brain surgeons and lots of needy brains. So the price is high and availability limited. So you use them only where their skills are absolutely needed. And then get them out of the room so everyone else can relax. A similar proposal has been made for patterning ICs. But before we rush into that, some background is in order. We pushed regular optical lithography as far as we could and then a little bit farther. Then we tossed in a drop of water and pushed it beyond that. And we came up with optical corrections – kind of like photonic pre-equalization – and continued to push things. As usual, the death of visible-wavelength lithography was announced long before it happened. Especially given that it hasn’t happened yet. But still, imminent demise always stimulates thoughts of the Next Thing. And if you’re really serious about being taken seriously, the first thing you have to do is come up with a three-letter acronym (TLA) that everyone – well, not, not everyone, only the cool people – can use. At that point, you ban the use of the phrase for which the TLA stands and use the TLA exclusively as a sign of tribal membership, exclusivity, access, and possession of secrets exposed only to the Initiates. In this case, you would call it Next-Generation Lithography, immediately replacing that with NGL. And so, in order for this article to be taken seriously, we will henceforth stick exclusively to the NGL moniker. One of the obvious early NGL candidates was extreme ultra-violet: doing the same thing we do now, only with shorter waves for better feature resolution. They were talking about this when I was in college. And they’re still talking about it. OK, they’re also working on it, but… let’s just say that the schedule has slipped. The other thing they’ve been talking about since before I was in college is electron-beam, or e-beam, lithography. Or EBL. Also known as maskless lithography or direct write. If you’re new to reading about e-beams, you may immediately be confused by the liberal unexplained use of the word “column”: this is insider-speak for the apparatus required to generate (or at least focus) a single e-beam. The column electrostatically manages the beam to deal with the many possible sources of beam spreading: spherical and chromatic aberrations, electron-electron repulsion (these guys don’t like to play nicely together), electrons scattering in the resist (which has to be conductive to avoid charge build-up), etc. And the unit must keep tight control of the electron energy distribution, since there are no electrostatic lenses that can focus more than one frequency (so-called “achromatic” lenses, named for their ability to focus all colors at the same time). So the column is the heart of the beast. E-beam lithography is in use today as a way to create sharp, precise masks for use in regular optical lithography, but it’s not so commonly used for producing actual wafers, except in small quantities. And that’s for one simple reason: it’s too dang slow. With a standard e-beam machine, you’re using one beam of electrons and you need to sweep it over the entire wafer. At its most basic level, you will scan back and forth across the wafer, turning the electrons on and off (“blanking”) according to the pattern being exposed. An electron beam is very thin. It takes a lot of scanning to cover a whole wafer. And so you don’t get many wafers done. There are a couple of ways to make this faster. 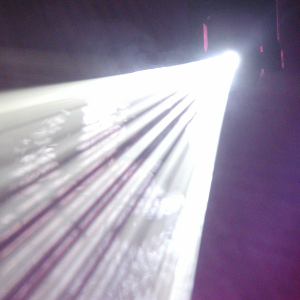 One is simple: use more beams and expose in parallel. And you’d be surprised at the kind of parallelism you can get: as many as a million beams. You can put multiple columns in a unit and then cluster multiple units together to do even more wafers (although each unit would work on a different wafer). The other way to speed things up is not to scan, but to go directly to where you’re needed. The traditional raster approach ends up doing a lot of scanning over areas where the e-beam is shut off: that’s wasted time. The newer approach is to do “vector” scanning – analogous to vector graphics. The beam goes specifically from feature to feature. All of this helps, but it’s not clear that it helps enough for EBL to become the NGL. One of the companies developing this technology, Multibeam, has proposed using EBL not as a replacement for current lithography, but as a complement to it, calling the idea Complementary EBL, or CEBL. The idea is to move to a 1-D gridded interconnect layout so that, on any given layer, metal lines go either horizontally or vertically, but not both. This gets rid of a lot of exposure funkiness. The metal lines themselves aren’t easy to print, but they can be handled by double patterning. The really hard part is cutting contacts and vias, along with the cuts in lines that go across the grain, so to speak. You’re mostly not going to have long lines going across the die; there will be multiple features along that grid line, and you can think of them as one long line that then got cut up into segments. It’s those segment cuts that are tough. Using EBL for these critical steps doesn’t permanently remove the need for double-exposure; electrons do scatter, and, at some point in the future, we may need to double-pattern with EBL as well. But that’s not now, so we get a reprieve, and, even when it is needed, at least there are no masks involved; it’s just a process-steps thing. Multibeam is currently testing their 4th-generation column for use in CEBL. They bring together 100 columns into a single module, which can handle 5-10 wafers per hour. They can cluster 10 modules together to give up to 100 wafers/hour of throughput. This may still be a pinch-point in the process, but it is still intended to reduce cost below both quadruple-patterning and an EBL-only flow. It fancies itself the brain surgeon: coming in just at the moment when delicate hands are required. Also, Dr. Lam says he’ll be presenting the entire process at a SEMICON West TechXspot in July.